BANK SAYS - SELL QUICKLY! If you miss this opportunity you have missed a wonderful chance to own a finely crafted home by a master builder with high quality throughout! Home backs up to greenspace - No neighbors in rear - total privacy! LOW PRICE FOR FAST SALE! Beautiful interior, finely crafted with lush conservation area in rear - and maximu privacy in your pool and on your large Terrace! Buy now - while the price is right !. 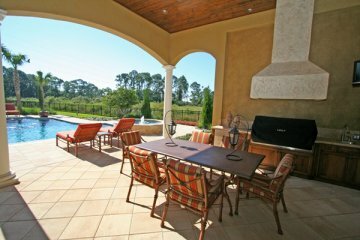 “Allesandro” is yet another masterpiece created by one of Central Florida's famed custom builders - known for his outstanding quality and family-friendly floor plans – which will suit almost any type of family formation. Located in exclusive gated community in Windermerewith glass walls, doors and wide windows that overlook a tropical, lush Conservation Area in the rear - providing maximum privacy! This amenity-driven residence is perfectly designed for all members of the family. 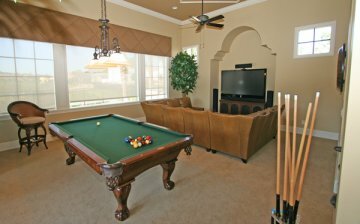 5 Bedroom suites (22' Master Suite with Loung Area), Exercise Studio with private courtyard and Refreshment Bar, 1st floor Billiard/Game Room with glass doors opening to the Terrace/Pool Area - also with large Refreshment Bar! Gorgeous Study/Library with double-sided stone fireplace! Wood floors warm the library with rich faux-leather finish on the walls! Tumbled stone floors (for easy maintenance) flow through main living areas, wide hallways and a gourmet kitchen. Graceful arches define the entrances to various rooms. 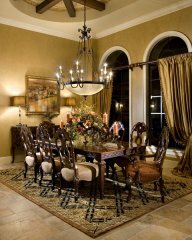 Ceilings in main living areas boast incredible details with handsome beams and hand-stenciled detailed designs. 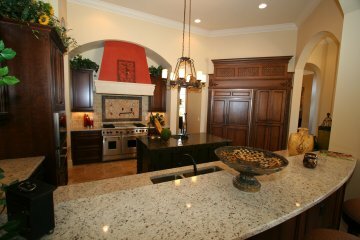 Family room with beautiful stone fireplace and entertainment center, also has French doors opening to Terrace/Pool area ! This is a single story home - with bedrooms strategically place within the floor plan so that visitors enjoy maximum privacy in a guest suite with full bath which is set apart from all other bedroom areas. The gourmet kitchen offers custom cabinets topped with gleaming granite, Wolfe appliances, gas cooking, walk-in pantry and an 11’ long granite snack-serving bar which opens to a spacious family room with entertainment center. 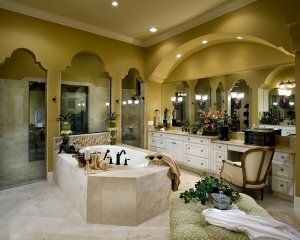 Every bedroom has direct access to a bath. All bedrooms wired for cable T.V. The outdoor area is simply fabulous! A deep tiled Terrace spans the entire rear of the home with multiple French doors opening from all living areas and master suite. The pool and spa are heated for year-round enjoyment. The launch area into the famed Butler Chain of Lakes is nearby and you have plenty of room in a 4-car Garage to store an extra boat along with your cars – or just use the extra space for storage! See the Virtual Tour! It is lovely! Professional interior designed, artistic touches throughout! Formerly owned by out-of-country owner - seldom used! Looks new! Now a BANK SALE - WELL BELOW MARKET!